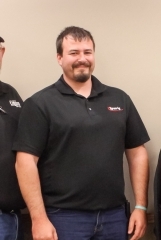 Alex began at Tyree Ag in February 2016 and helps with product deliveries, as well as with ground and aerial application loading. He was born in the Kinsley, KS area and grew up working on his family's farm and cattle operation. He graduated from Kinsley High School and then ventured west to attend Dodge City Community College where he majored in Criminal Justice. Alex then attended and graduated from Kansas State University with a Bachelor's degree in Criminology. Throughout college and after he returned home, he continued to work on his family's operation and later worked as an Equipment Operator for the state of Kansas. Alex currently lives in Kinsley.